Thomas J Lee FSWPP Master Photographer CrSWPPThis shows the qualification attained by Thomas Lee within the SWPP and associated societies. To be or not to be? - (Qualified) - The final question! A Website (Part 1) - Why Should I Bother? Thomas Lee has an Exhibition here. Tom is a UK based international photographer recognised for his expertise in digital image capture and has accumulated over 30 international awards in recent years. He uses the latest equipment to produce contemporary works of art you will cherish for a lifetime. The standard of artistry and quality of printing means that clients receive images that are not compromised by anything less than a premium service. Toms most recent project 'Innocence Turned' involved his renowned Fantasy Portraiture style in which he created an exhibition of 20 fine art prints, a book and a video of this major work. Tom has a global reputation having given many seminars in the UK and abroad and writing extensively for the SWPP magazine Professional ImageMaker. He was awarded Fellowship of the SWPP (Society of Wedding and Portrait Photographers) in 2002 and made Vice President in the same year. Continuing in the role of Senior Strategic Advisor, he received an award for his outstanding contribution to the photographic industry in 2007 and also became a Craftsmen of the Society in the same year. Tom is also a member of NAPP (National Association of Photoshop Professionals), GPA (Guild of Photographic Artists) and WPPI (Wedding and Portrait Photographers International). 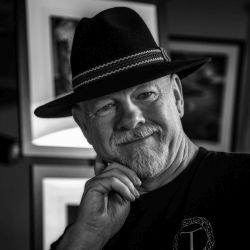 Tom has also authored several books including 'Art in Focus', 'Digital Capture and Workflow for Professional Photographers', and has collaborated on two books with renowned American photographer Norman Phillips, 'Lighting and Posing Techniques for Photographing Women' and 'The Photographers Ultimate Cookbook'.